Aeratis Porch Flooring is a solid-extruded cellular PVC tongue and groove porch plank that gives your customers the flexibility to work in covered and uncovered environments, while providing traditional and historical design characteristics. 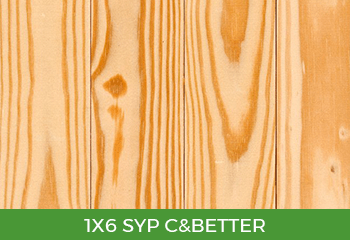 Southern yellow pine is harder than most softwoods and is known for its strength and durability. Economical yet rich in character, Southern yellow pine creates an atmosphere of traditional beauty in any room. C & Better SYP Flooring is primarily Clear grade, with very few characteristics left in, and little or no open defects visible. 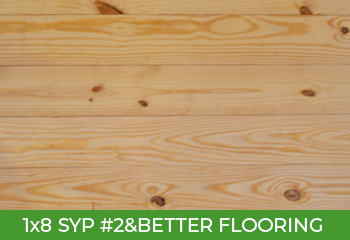 #2 SYP Flooring allows some knots and more characteristics, even some open defects. It is used as a cost effective cutting grade if long lengths are not needed, cutting around the knots and defects to suit your desired appearance, or used “as is” for shop floors, barns, tack rooms and the like, where those characteristics fit the bill. 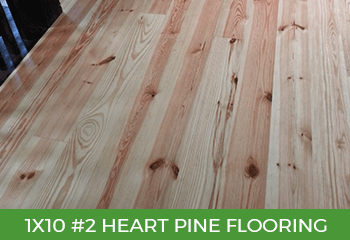 Our #2 Heart Pine is a sort within the #2 grade, pulling pieces with 50% or more heartwood on the face… this heartwood patinas beautifully with direct or indirect ultraviolet light exposure, giving a warm and inviting look to any family room or den. 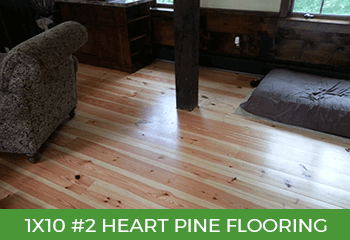 Heart Pine flooring and a field stone fireplace are a combination that’s hard to beat for that country home! At Warren Trask we maintain relationships with the best mills in the country and stock a full line of the highest grades, so you can be assured of grain quality, tally and consistent availability. Whatever your fir needs, think Warren Trask. Flooring, decking, trim boards and pattern stock are all available. C&Better VG, and 1×4 & 5/4×4 B&Better VG are typically available as well. Also available at Warren Trask is the Treated and Primed “Fortified” D.Fir from Sierra Pacific in Partnership with Kop-coat, it has a very similar treatment as the Claymark pine products. 30-year warranty for commercial applications. Available in 1×4 & 5/4×4 sizes in S4S-EE and T&G profiles, random lengths 6-20’ odd and even tallies. Blue Star is a great choice for exterior decks, covered porches, three-season rooms and enclosed porches or four-season rooms. Warren Trask stocks the full line of Blue Star products including 1×4, 5/4×4 & 5/4×6 decking both in unfinished and pre-stained in Blue Star Plus, 2×2, 2×4, 2×6 & 4×4 deck accessories, 1×4 – 1×12, 5/4×4 – 5/4×12, and 2×4 – 2×12 all in S4S Sq.Edge dimensions for trim and architectural details, as well as 5/8×4 E&CB/EB, 1×4 CM/VJ, 1×4, 5/4×4 & 1×6 CM Porch Flooring, 1×6 E&CB/V-Joint, and pergola parts. The majority of Blue Star products are sold random odd & even lengths, 6-20’. All Blue Star products are manufactured from Malaysian Timber Council/PEFC Certified Timber. Widest array of sizes and patterns available 12 months of the year! Warren Trask delivers to all of New England and areas of New York. Our delivery schedule includes at least two deliveries per week for every region. CLAYMARK PRODUCTS YOU WON'T FIND ANYWHERE ELSE!